This ain't over yet. The allegations about sexual harassment will follow Herman Cain like a curse. Sooner or later someone will dig up chapter and verse: the details of the allegation, who was paid what, why they were paid anything at all if they made false allegations. Only then will we be able to say whether this is trivial nonsense or career killing. But this is not good for him. Part of Herman Cain's appeal is that he's seen as a straight talker, not like those twisty politicians. So changing his story three times in one day is not impressive. It is also clear that while Herman is Cain, his team aren't able. When a politician is in the middle of a personal firestorm it is inevitable that they can't think clearly. Even the consummate tactician Bill Clinton made a hash of it. So they need a team who can speak hard truths. So often it is the cover-ups that kill, not the scandal itself. Whatever happened, they should have got it out into the open. Honesty has its own rewards. Even if the past looks bad you don't end up looking shady in the present. For now this confirms the Beltway impression that he's a lightweight, albeit one with a terrific singing voice. But it's what conservatives in the rest of the country think that matters. I suspect it will hurt him, but not a lot. After all, they don't agree with his central tax plan but are willing to overlook it. They like the man and his story. 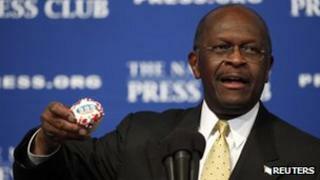 Only if he manages to undermine his own image, as an upright Christian and a plain speaker, will Herman Cain be damaged. Of course the real winner is Mitt Romney. Every moment the media spends tearing down a rival is as good as unpaid advertising.